LiveU: 4G uplink broadcast production. Hackensack, NJ, 25 June, 2013 – LiveU (www.liveu.tv), the leader in portable live video-over-cellular solutions, has announced that the innovative German production company Tividoo has deployed LiveU’s LU-Smart mobile application for regional public broadcaster SWR’s online coverage of the recent Mainz marathon. The LiveU technology was supplied by LiveU’s German partner Netorium. Supporting all iOS/Android devices, the LU-Smart mobile app represents the next level in mobile newsgathering, allowing LiveU’s broadcasting and online video customers to extend their coverage using a smartphone or tablet. Based on LiveU’s fourth-generation uplink technology, LU-Smart bonds internal Wi-Fi and cellular connections to reach optimal video quality. The marathon – which attracted approximately 9,000 runners and 15,000 spectators – was covered by a combination of emerging technologies. Tividoo filmed the event from a car alongside the runners, and then held post-race interviews with the runners in the main square. The car was fitted with a Viprinet Multichannel 510 Router that can bond up to 4 x 4G networks as well as a Ka-Band satellite connection. This created a WLAN around the car. 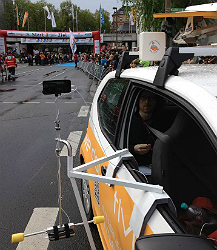 While moving and filming the runners 4G uplink connectivity was used, augmented with Ka-Band when stationary at the end of the race. An iPhone 5 with the LiveU LU-Smart app and an LTE SIM was attached to a steady rig and a stabilised car mount and used for the actual video capture. LiveU recently unveiled its patent-pending Smart Grip device, boosting smartphones with an additional cellular channel (MiFi) and battery in a handheld monopod for extra resiliency and performance.